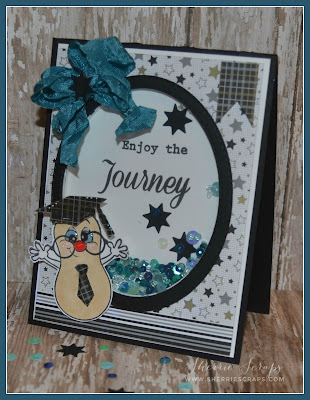 I found a little time to sneak away in my craft room to make a graduation card that I need for this weekend. I decided to make it a shaker card so I could use some fun new sequins that I picked up over at Craftin Desert Diva's. The pattern papers are from DoodleBug Designs~The Graduates collection. The sentiment is stamped with My Creative Time's~Life is Grand stamp set and the tiny black stars are from the Nesting Dies Starburst die set. I also used My Creative Time's~Scalloped Stitched Oval Die set for the window and to frame in the sentiment. 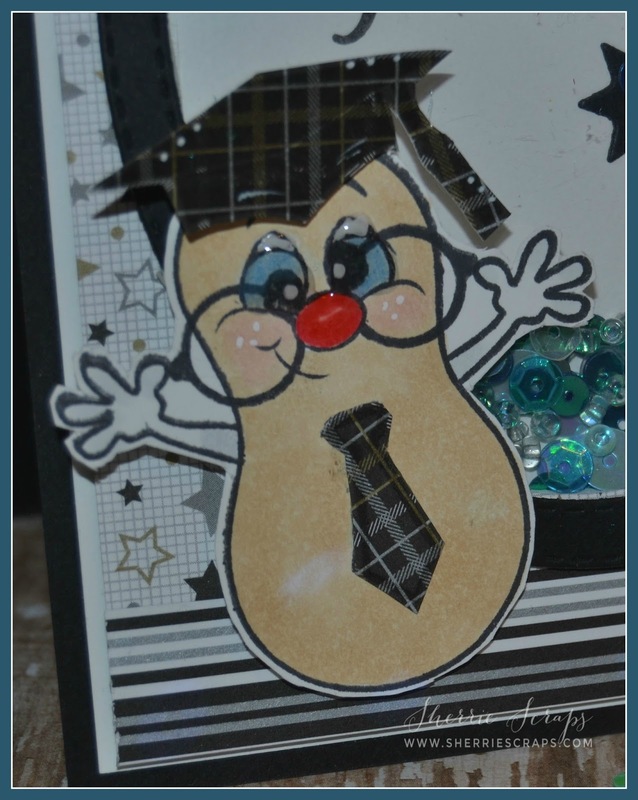 The fun little grad peanut is PK-1402 Little Peanut stamp set and colored with copics. I added some rosy cheeks, freckles and glossy accents to the eyes for a fun look. I used coordinating paper for the cap and cute little tie. I finished it up with a bow using blueberry crinkle ribbon from 3 Girl JAM and a star to the center. Oh Sherrie, this is so darn adorable!! I love the sweet peanut with his rosy cheeks and glasses!! The shaker window is fabulous!! The papers are so awesome!! This is perfect for a grad and it will be so adored!! Love it my friend!! Love that you made this into a shaker card. I definitely need to try some shakers again..it has been a while and I have seen quite a few cute ones. This is just one of the cutest cards I've ever seen! I love your attention to detail from the peanuts freckles to the the black stars scattered through out! Fantastic job! Really cute graduation card! I love the little peanut grad! Absolutely adorable. Great papers, love that it is a shaker card and the Peanut is too cute. Well done my friend. Such a fun card Sherrie. Love the papers and the sequins look great!! OMGOSH!!! How Stinkin' CUTE!!! LOVE your Shaker Card Sherrie!!! That peanut is just adorable!! LOVE IT to Pieces!!!! :) Have a Crafty Day my Friend!!! I adore this wonderful card ! I love shakers and this one is super cute ! Hope you have a wonderful day ! This is soooooooooooooo fun! LOVING the shaker and the colors!!!!!!!!!!! This is so sweet. Love the shaker. This is so super sweet!!! What a great graduation card! I always struggle with this type of card but your sharker is an inspiration! 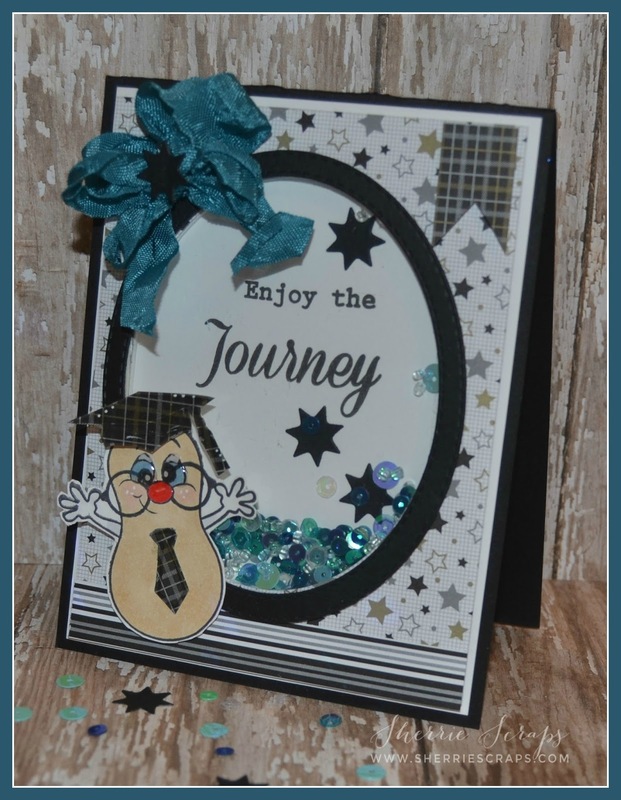 So happy you shared with us this week at Loves Rubberstamps, I hope you'll join us for more of our weekly challenges. Very cute shaker card! 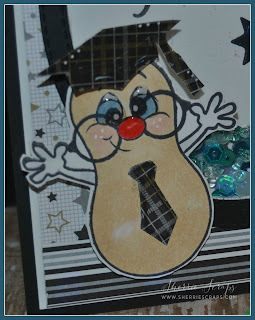 Love the fun design and that peanut is the cutest with his glasses! Such a fun design you created! Hope you are having an awesome week! What a beautiful shaker card. Great job. Thanks for joining us at Die Cuttin' Divas this week. Oh my favorite - a SHAKER card1 Love that fun little peanut and pretty sequins. This is a great card! Sherrie, this is adorable! I LOVE the colors of the sequins... Tara has so many sequins I want! The papers are marvelous and I just want to hug the little peanut! How precious. :o) Beautifully done as always, my dear friend! Have a twinkly night! I love your Mr. Peanut graduate…so cute. A beautiful shaker card too! Super cute Sherrie! I love the sequins! I've actually been making shaker cards lately also just haven't posted them yet. I really love them they are so fun! Great male shaker card, what a fun image! Such a fun card Sherrie! Love the fun peanut and shaker filled with goodness! The fancy bow adds a great touch! Very cute shaker card. Thanks for joining us at Cut It Up. Nice shaker, and you did a beautiful job on the bow! OMG!!!! I love your card and that little peanut is so adorable!! Again, I love it! Thanks for joining us for our Stars and Stripes challenge at Cut it Up! A wonderful card!! The little peanut is just WAY TOO cute!! I just want to squeeze him..LOL! Awesome shaker card my friend! Super FUN! Awesome shaker card! Love that bow too. Thanks for sharing it with us at Loves Rubberstamps this week, hope to see you again soon! Super cute Sherrie the Mr. peanut is so educated looking. This has got to be the CUTEST grad shaker card EVER!!! LOVE it Sherrie!! !